The common Canadian homeowner faced an average water damage claim of over $15,000 in 2012. Many of these claims derive from water drains that were damaged, broken, or clogged. Consequently, avoiding these problems will inevitably meet these costs, so don’t allow a clogged or damaged drain to cause you more trouble than it needs to! The Plugged Piper understands how irritating clogged drains and slow-moving sinks are for every homeowner, we also understand the troubles they can cause you in the future. You need The Plugged Piper’s professional plumbing services for the ultimate simple solution. The Plugged Piper offers a variety of services and solutions for commercial businesses, industrial facilities, and homes. With our help, you can keep your drains safe and clean with just one call! With our 24/7 services, The Plugged Piper is here to fix your drains problems immediately. Simply give us a call or send us your contact information, solve your clogged drain issues today! Eliminate Drain and Pipe Clogs without Corrosives with out Hydro Jet Service! 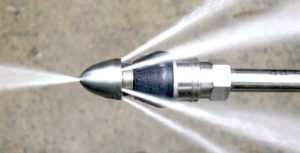 How does Hydro Jetting works? Hydro Jet Drain Cleaning involves a machine that clears blocked drains using high-velocity water pressure. This is extremely effective as well as environmentally friendly, without the use of corrosive chemicals. With the ability to fight through and clear the toughest blockages, hydro jetting thoroughly scrubs the full diameter of the pipe. Grease, sand, silt, and other debris often accumulate along the inside walls of drain pipes throughout the years. Hydro jetting burst through and flush away the accumulated debris. The nozzle (different types for pipes with 1.5″, 2″, 3″, 4-16″ diameter) of the tool is put into the sewer or stormwater line or pipe through an inspection opening (cleanouts). In order to clear the blockage, we blast high-pressure water through the pipe. Hydro Jetting is a great and efficient way to clean out blockage in residential or commercial drains. Without digging out the drain pipe, the water is simply inserted into the drain. Hydro jetting will make your drain pipes as good as new! It’s efficient, environmentally safe, and versatile. Keep your pipe system in a great condition with a regularly scheduled maintenance program. Maintaining and cleaning multi-unit high rises and townhouse complexes is our specialty. Our advanced equipment is capable of handling all the most difficult situations. We can accurately diagnose the problems and hydro jet the lines while causing little to no disturbance to the occupants. Our services will leave spotless results, we won’t leave a trace! Many manufacturers, restaurants and other commercial establishments have built up fats, grease, debris, and sediment along the inside wall of their pipes. These establishments require frequent maintenance to their drains and hydro jetting is the only efficient and effective way to remove them.